A poorly planned and poorly waterproofed roof deck invites rot…and frustration. An extended roof deck with a reliable waterproof surface creates more outdoor living space and residential luxury. 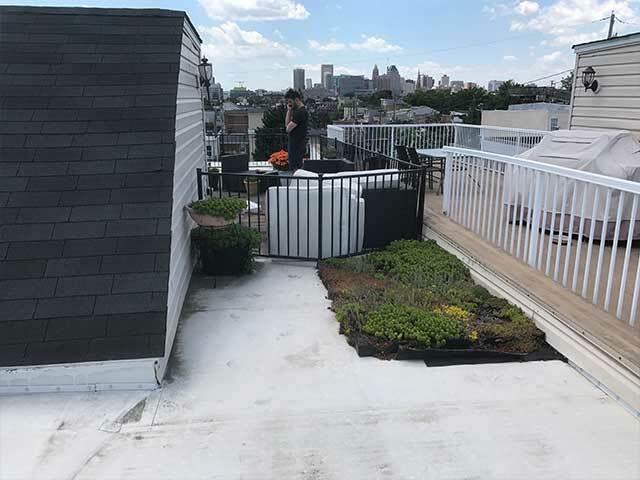 This urban homeowner’s flat roof deck could barely be considered useable outdoor living space although it had the potential to be a luxurious and desirable feature adding value to the property. The torch-on roofing product they had was not only unattractive but retained too much heat in the summertime. Traditional torch-on roofing does not make the most attractive or comfortable deck surface. The placement of the rails reduced the square footage of usable outdoor living space considerably, leaving much of it inaccessible and impossible to safely clean. Poorly placed railings needlessly waster usable space when the luxury of a roof deck is such a cherished residential feature. 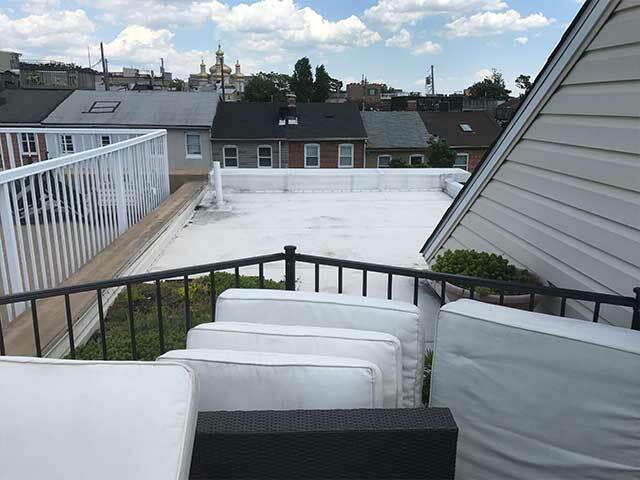 Even if appearance is not motivation enough to transform a torch-on roof deck, water leaking through makes a new flat roof deck surface a necessity. The unsightly torch-on roofing developed cracks and flaked off. This waterproofing failure allowed moisture to make its way to the structure below which meant rot would develop quickly. They turned to the waterproofing experts at Duradek MidAtlantic who introduced them to the Duradek trained, professional installers at PG Builders. The professional Duradek installers of PG Builders are well versed in all details involved to create an extended roof deck. First, the failed torch-on product and old, misplaced railings were removed. 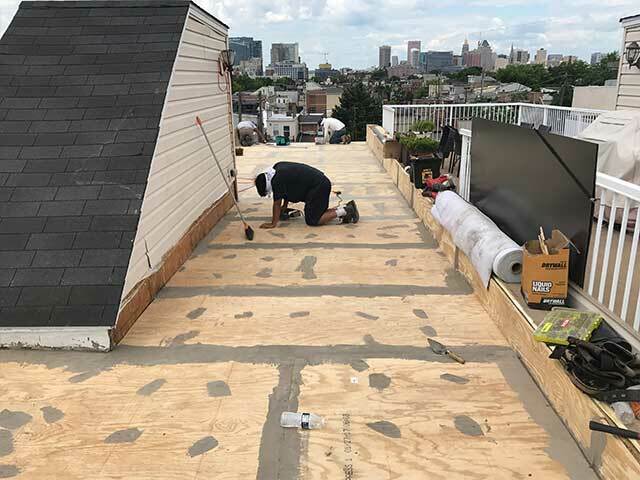 Fresh, untreated ¾ʺ T&G plywood was laid at the recommended slope for the Duradek Legacy Driftwood membrane installation. The substrate is prepared with untreated plywood. All joints and screw holes are filled for a smooth surface to apply the Duradek membrane. 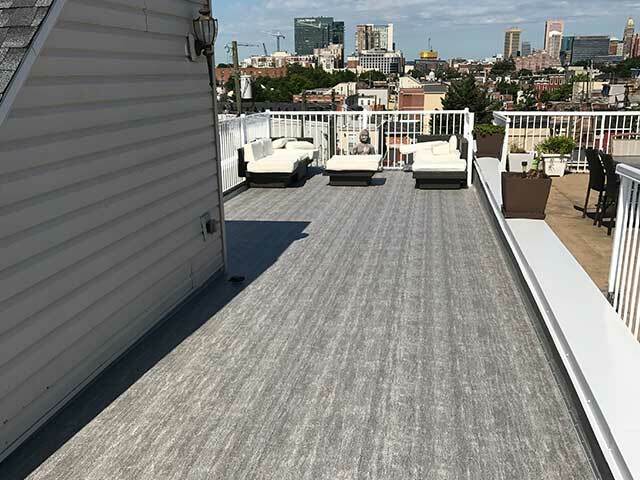 By using Duradek Ultra, which is classified as both a roofing membrane and a pedestrian traffic surface, PG Builders effectively turned an unattractive flat roof into a beautiful deck with a one-product solution. 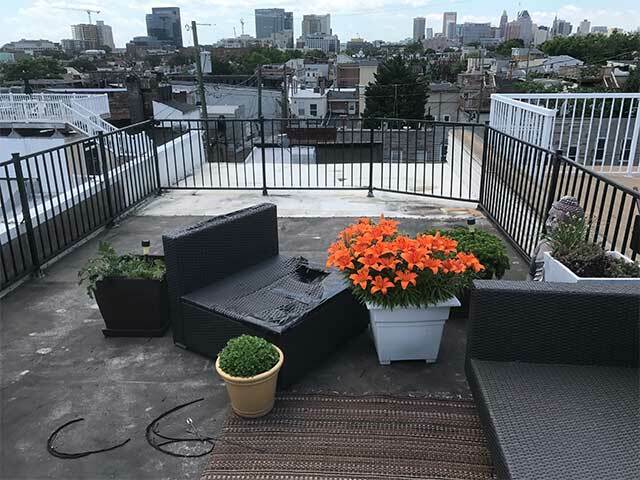 With the addition of new Durarail Aluminum Picket Railings, they safely defined the extended area of their rooftop terrace to the perimeter of the flat roof. Previously wasted space and a point of waterproof vulnerability now provides attractive, low maintenance, and useable outdoor living space where they can be proud to entertain—with confidence that the living space below is protected. 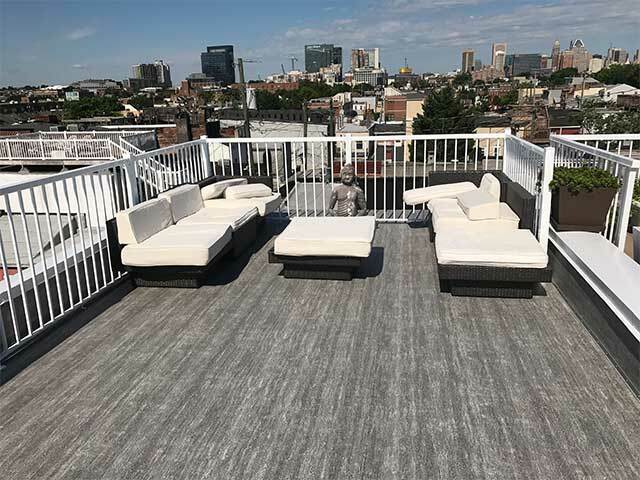 This extended roof deck creates more usable outdoor living space – without the need for maintenance with the long-lasting performance of Duradek vinyl membranes and Durarail Aluminum Railings. Not only is torch-on roofing too hot for bare feet and paws, but due to being all black, it retains heat and superheats the structure leading to higher air conditioning costs. Duradek provides an attractive and safe Green solution for roof decks, and it is much nicer on bare feet! View or download the .pdf version of Case History #178 with before and after pictures and installer details. Creating more outdoor living space? Check out how Duradek compares to other traditional deck and roofing systems.